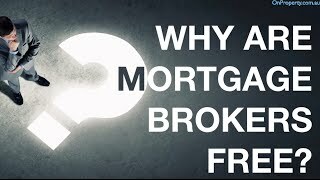 Why Are Mortgage Brokers Free? Why Are Mortgage Brokers Free? Mortgage brokers do a lot of work to help you get your finance approved. So why are mortgage brokers free? How do mortgage brokers make money? Why are mortgage brokers free? Mortgage brokers do a lot of work to help you get your finance over the line and they give you access to over 30 different lenders that you can choose from. They do a lot of work and this takes time and manpower. So why are mortgage brokers free? That’s what I’m going to answer in today’s video. Hey, I’m Ryan McLean from onproperty.com.au, your daily dose of property education and inspiration. And the reason mortgage brokers are free is because mortgage brokers are paid by the banks and lenders when you successfully get a loan. Mortgage brokers aren’t paid by you, but they are paid a commission by the lender that you end up going with. And they’re paid based on the value of your loan. If people had to pay for mortgage brokers’ services, chances are, not many people would actually be willing to pay for brokers. And, thus, they wouldn’t exist and wouldn’t be able to make any money. So, yes, it would be nice for them to charge their customers but they’re already making money from the banks so they don’t need to charge their customers. So you may want to ask, “Well, how much are they paid?” and, look, I’ve done a full episode on this, which you can get at onproperty.com.au/172. But mortgage brokers are generally paid in the rough area of 0.3-0.7% upfront commissions on the value of your loan. Which works out to, if you got a $500,000 loan, that works out to around $1,500-$3,500. And remember, they only get paid if you get approved and you get your financing. If you don’t get approved or you don’t get financing for whatever reason, then they’re doing all of the work for nothing. They also tend to get 0.1-0.3% trailing commissions. So, basically, as long as your loan exists, they’re getting a smaller commission on the remaining value of that loan until that loan ceases to exist. So, that is how mortgage brokers get paid. They’re free to you because they’re being paid by someone else. So, that is basically the gist of it. Now, I’ve also done an episode on why you’re not going to pay more for a loan even though the mortgage brokers are getting commission from the banks. Because, basically, the banks would have to pay someone to work with you and in this way, they’re just paying the mortgage broker and they don’t have to pay an employee on-staff full time. They only pay the mortgage broker when they successfully get a loan. So, for me, if I was a bank, it sounds like a pretty good deal to me. Give a small commission to someone and only pay out when I actually get a customer versus paying an employee who may or may not deliver me customers. So, this isn’t going to add to the value of your loan. You aren’t going to get a higher interest rate. In fact, the chances are, you’re going to be able to access to a lower interest rate. Either because you just get access to a wider variety of lenders, so you can choose the right one for you. Or your mortgage broker may be able to negotiate on your behalf. Some suggestions that I have for you when you’re working with a mortgage broker, is choose a mortgage broker that you can trust. Mortgage brokers are paid different commissions from different lenders. So you need to choose a mortgage broker that put your interest first over the interest of themselves. Some mortgage brokers out there will recommend the loan for you that gives them the biggest commission even though it may not be the best loan for you. So, choose a mortgage broker that you trust and always ask to see all of your borrowing options rather than just the one or the two or the three that they recommend. Ask to see everything and double-check their work. I also suggest that you try and make life easy for your mortgage broker. They’re going to want to help you out if you’re trying to help them out. Remember, they only get paid when your finance is approved and you actually get your loan. So, if you make their life easy for them, providing them with the right documents, providing them with everything they need to get your finance approved, well they will likely to work hard for you because they know that this is going to lead to a pay day for them. And people just love working with customers who are trying to help them do their job and trying to help them get paid. So, if you can make life easy for your mortgage broker, you’re probably going to get… uh, have a better relationship and get better service out of them. And, as I said before, always double-check their recommendations yourself. So, by this, I don’t mean go in to the bank and double-check with the bank where you can borrow but rather ask to see a print out or ask to see a list of all of the different options that you have available; rather than just the ones that they recommend. And so you can assess all of your different options and you can make an educated decision. Because what will happen, most mortgage brokers will tend to spit out maybe 3 top options for you. Which makes sense because you want to minimize the overwhelm, you only want to have a couple options to choose from. But I do think it’s a good idea to ask for the whole list so you can see everything and make a decision yourself. So I hope that answers your question, “Why are mortgage brokers free?” They’re free because mortgage brokers are paid by the banks when you get a loan. If you are looking at investing in positive cash flow property, then check out my 10 high rental yield property listings, absolutely free. I show you where positive cash flow properties are in Australia with real property listings. Go to onproperty.com.au/free to get access to those free listings over there. So until tomorrow, guys, stay positive.